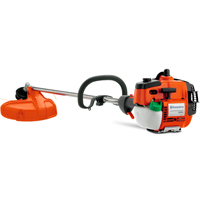 Husqvarna Straight Shaft String Trimmer – 1.2 HP, Model# 326LX. Lightweight and reliable trimmers designed for high performance. The E-TECH II engine is a breakthrough in two-stroke technology resulting in lower emissions, exceptional fuel economy, high power, superior torque and low noise. Don’t accept less when you can have the best!